What do we do? How do we do it? Why do we do it? 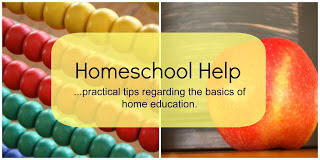 We all have a homeschooling style or method. Yes, you do, whether you know what it is or not! 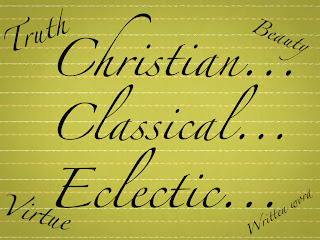 ;) And yes, eclectic IS a style. 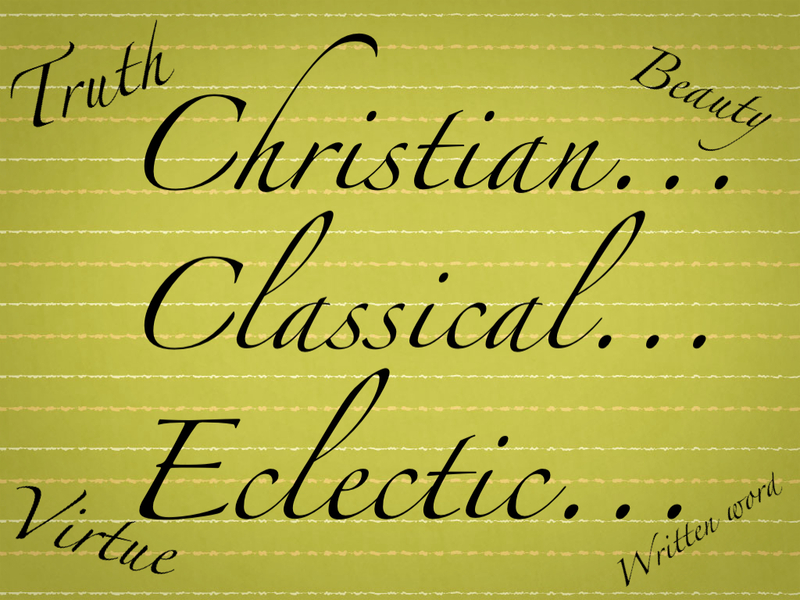 I find myself pretty eclectic...but with deep roots in classical education. I remember sitting in a classroom in college after having read The Abolition of Man by C.S. Lewis and The Lost Tools of Learning by Dorothy Sayers and within me, certain truths of education and learning took root. Along with an understanding of why things in public schools and society as a whole were so far from ideal. I was amazed how the education classes I took at the same time as my Christian Studies classes...at the same school often in the same building...truly rivaled one another in theory and foundation. I sat in Christian studies classes that taught Biblical Worldview, Christian Doctrine, the Centrality of not only God's Word, but the written word, the necessity of absolute truth, of moral absolutes. Yet in another classroom down the hall I heard of classroom collaboration and facilitation. It seemed harmless until you recognize that those ideas were based solely on the acceptance that truth and knowledge are found within... you need only find it within yourself. Modern education philosophy is based in social constructionism-- the idea that society develops their own version of truth and ideals. So, what was I to do? The ideas of collaboration and facilitation and other methods I was learning are not inherently evil...they are good ideas. Just foundationally incomplete. If we can collaborate to find truth outside of yourself..in God's Word...great! If you can facilitate learning by gently leading your children to truth and exciting them to find the truth...wonderful! The methods and ideas I learned were not bad. They were simply not enough alone. Early in my homeschooling endeavor I read The Well Trained Mind by Jesse Wise and Susan Wise Bauer, and it simply resonated with me. It supplied a road map for the theory of education I already believed in. However, it is never my intention to place myself or my children in an educational box. I never plan to close off our techniques or learning desires because they don't fit my "style," but there are certain truths -- deep truths that govern my homeschool and curriculum decisions. Not so much WHAT we learn (content) but more HOW we learn. First and foremost, our home is Christian. Our education is Christian. We cannot separate our faith nor do we want to. We believe in the infallible inherent Word of God. We believe in absolute truth. We believe in imparting knowledge of God, His Son, His Word, His Creation, and His ministry, to our children. Our relationship with Jesus Christ is the heart of who we are and what we do. He is the why. We homeschool ultimately to raise Biblically sound, Gospel proclaiming, righteousness seeking servants and warriors for the Kingdom of God. Everything we do...we do to this end. Now, this doesn't mean we only use Christian curriculum or every page of our math has to have a Bible verse on it. As extreme and radical a goal we have-- math is math. We use resources. Christian, secular...it doesn't matter if it works to our end. If it goes against what we believe, odds are we won't use it...but if it remains silent and still meets the needs we have at that moment...it works. We teach from a Biblical worldview. WE do. Not our curriculum. Sure, often the curriculum helps, and I appreciate that, but I don't automatically count out something because of the publisher. We are not classical homeschoolers for the sake of being classical homeschoolers. And honestly? When we wanted to study U.S. history this year, we did..regardless that it is not the "plan" outlined in the Well Trained Mind. To me, classical education is not about content. However, there are certain truths that ground us, certain roots of classical education that draw us in. It is these roots that hold us tight. I believe in classical education-- the foundation of it. I believe there is merit in the understanding of the three stages of learning-- the Trivium: the grammar stage, the logic stage, and the rhetoric stage. These developmental stages make sense to me. The importance of the written word is important to me. I am not saying we don't or won't use videos, interactive computer games, or technology...but the centrality of our educational pursuits is with the written word. We love books. I love the cycles of classical education. Chronological history just makes sense. Being language based and being rooted in the written word by studying grammar, spelling, and writing-- makes sense. It is through the written word that we express ourselves. Our ability to communicate efficiently and accurately is paramount to every area of life. However, systematic, can be defined many ways. Even unschoolers can study systematically. You characterize and study topics if not whole years. This is not solely about content. I feel free to step outside of chronological history cycles or science cycles to meet our families needs. Being systematic often can be in logical reasoning about something...not a years worth of content planning. I believe in challenging my kids. I believe in early education. I don't buy into the whole "it's just kindergarten" or "it's just first grade." I believe in enjoying the learning process. I believe in having fun, cuddling on the couch and reading good books. Rigor does not mean 8 hours of school a day. It means we are intentional about pursuing academic excellence. This may be one of the most critical elements of classical education for me. The pursuit of truth, beauty, and virtue. I can talk about this forever so I will be short here and expound upon it someday soon. Truth, beauty, and virtue are absolutes. They are not self defined... they are founded in God's Word and in God Himself. God is Truth. God is Beauty. God is Virtue. I desire to teach my children the meaning and beauty of these truths. How to look for them in others, themselves, and the world around them. I want to read a book and lead them to find the truth, the beauty, and the virtue within. To take time to discover, discuss, and recognize the importance of such absolutes. My roots are in classical education. Not content, curriculum, publishers, or cycles. Those are all negotiable. As far as curriculum we find what works for us, with our end goal always in mind. Curriculum is a means to an end. They are resources. What works one year will not work another. What works for one child may not (probably won't!) work for another. We want to facilitate a love of learning. Make curriculum work for you, not be a slave to it. This week my kids are enamored by the Hopi Indians. We spend a lot time making pueblos and Hopi scenes, playing Hopi children's games. My schedule, not a curriculum's. Next year, they won't remember much about our curriculum, but they will remember that Hopi children shot arrows through rolling hoops. What we do is deeply rooted in certain truths, but the day to day execution of such truths is extremely flexible and eclectic. I may love classical education, but I love my kids more than any style or method. So, I take the truths of why I love classical education and apply those truth no matter what content we are studying. Teaching styles are all about what you believe in and why, and what and how you want to communicate that to your kids. It's personal, it probably will change! And ultimately it's not about methods for me, it's about some simple truths that can be communicated into any style we choose. 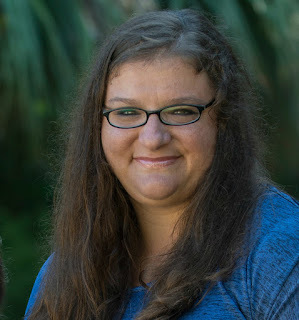 Check out what's the other Homeschool Help Series bloggers have to say about their homeschooling styles!